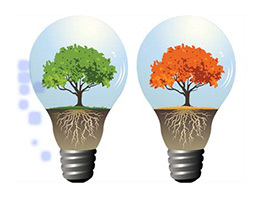 Although not every business uses abundant sources of natural resource energy, they all use some. When all corporations start to include alternative enegy resourses into their structures, everyone benefits and our natural resourses are less stressed. Even though the price of oil may be once again soaring towards $100.00 per barrel and above, energy conservation is not just about money. Considering the environmental chaos caused by the "drill baby drill" philosophy, there is very little doubt that the fate of life on this planet may very well depend on energy conservation. At the very least, when you conserve energy, you will be actively doing something to resist the depletion of natural resources. The result will literaly leave more earth for future generations. There are a number of things you can do to help conserve energy that you may not have thought of before. You will find that by implementing these changes your lifestyle may improve as well as the fact thay you may save money. Additionally, you may even find that it is feasible to end your reliance on 90% of commercial fuel resources within two years. It is crucial to think of the use of petroleum energy conservation as a personal commitment. For example, at the present time you may consider your SUV to be a gerat vehicle to sport about in, however, the processed resources it takes to keep it running may be dangerous to your children, for various reasons that are beyond current consideration. Some of these reasons may include that at an allowable age, your child may be "told" they have to go to war in order to keep fighting for precious oil. The oil wars are not so likely to be solved in this generation's time. Also, with research findings telling us now there are definite health issues that could result from the petroleum processing, your children may be left to deal with this. There are questions that everyone should ask regarding what are the potential health hazards of what we are doing now for energy, that will directly affect the health of future generations. When you stop and think about the costs imposed from relying on commercial energy resources, it should inspire everyone to look for alternatives. Changes like the return to having only one car per family. Consider gathering together with your neighbors and co-workers and form a carpool network. In a similar way, cutting back on electricity, will benefit you. Using the hot water tank only when in need of it, and turning it off during the day will cut down on cost. Lessening the use of televisions, computers and entertainment units will also help cut back on cost. It is amazing how many hours you are charged by leaving your TV on or leaving your computer and stereo on while you are not actually using them. Installing units in your home that gather and store energy from sunlight can be a valuable investment that will pay off in future years. Using energy alternatives can also benefit the corporate world. As you may be aware, the current financial situation in the United States is going to cost taxpayers well over 700 billion dollars. As taxes go up, it puts more pressure on businesses to fund this burden. Continuing to pay workers' current wages or future higher wages based on cost of living increases, many businesses large and small, may feel that they have to cut back on personnel, close, or take drastic measures and farm out the work to other countries at a better pay rate. As a result, many people could wind up out of a job and if they are homeowners, the possibility of facing foreclosure may be a very real threat in the future. Today, it seems like all of our money is either spent on energy consumption or taxes. All kinds of stress and anxiety is unfortunately the result. While you may feel that you are stuck in the energy rat race, getting out is as simple as reducing energy consumption and incorporating alternative energy sources. Whether you start with conserving the use of household appliances, or curtailing automobile usage, you are sure to reap significant rewards for each step that you take. When everyone pitches in, everyone wins. Hey, That was a great post, I really enjoyed reading your blog. I am going to bookmark it and will make sure to check often. Thanks for taking the time to write that, I found it very educational. If you get a chance you should check my blog as well. I hope you have a good day! This has truly sparked up an idea in my mind. That is a superb website submit. Astonishing Content! My spouse and i was merely contemplating that there is significantly absolutely incorrect critical info within the subject line however you simply just transformed my personal impression. Appreciate your sharing an awesome submit. Wow, that’s really nice info, thanks.